Ah, the flexi. Truly the symbol of all things DIY, cheap and cheerful and not as disposable as one might think. Put a flexi in a wraparound sleeve, as in this example, and print that wraparound sleeve in a single colour, and you’ve got an archetypal indie-pop release. Waterbomb! was a fanzine, if memory served correctly, and they gave out flexis with each issue – and also, unless I imagined this, made more flexis available for other fanzines to give away as well. There’s no date on this record, but I’d position it at somewhere towards the early 1990s. That time must have seen endless charity shop raids for 1960s annuals and magazines, as no end of records like this, and fanzines of the time, featured copied images of happy, free, nouvelle vague-looking females doing their own thing. 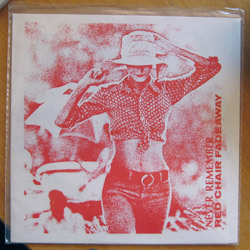 On this record, there’s one on the front, one on the back, one on the insert within and even one on the flexi itself! A friend of mine recently informed me that you can still get flexis manufactured – this is great, I thought they were a thing of the past, a strange anachronism of ‘this used to all be fields’/’I remember the days before CDs’-type old-man chatter. Maybe I’ll get a flexi made… they’re pretty expensive, though!